Following on from my recent post featuring the ongoing development of the forerunner to the Hawker Hurricane. I wanted to feature the airworthy surviving Hawker biplanes that we are lucky enough to have as part of the airshow circuit here in the UK. The quite literal shining light of the surviving Hawker biplanes is the immaculate Hawker Fury K5674. 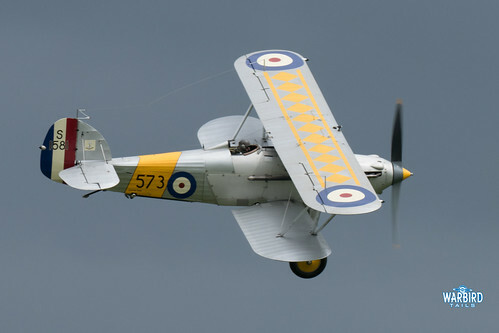 This airframe was restored by and is now operated by Guy Black’s Historic Aircraft Collection. 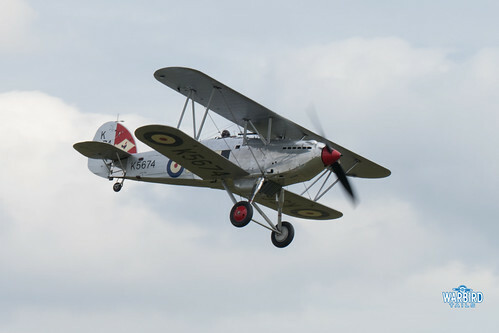 HAC have been responsible for reviving three of the five Hawker biplanes currently in airworthy condition. This airframe was acquired by the collection in 1994 having been sent to South Africa in 1940. Prior to this it had spent time with 43 squadron at Tangmere. Today the aircraft wears the colours of this squadron. 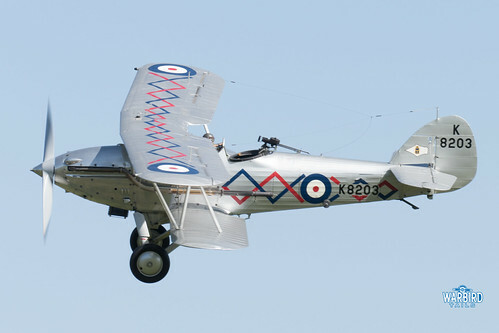 Restoration work took 15 years and the aircraft made its first post restoration flight in 2012 from Goodwood. Further engineering challenges meant that the aircraft did not make its airshow debut until the May show at Duxford in 2015. This aircraft sometimes seems like a hidden gem of the UK Airshow scene, making very few appearances since joining the circuit. Anyone who has attended Duxford shows over the last couple of years may have been lucky enough to see Charlie Brown deliver a wonderful display in this graceful machine. The growl of the 525hp Kestrel II engine’s short exhaust stacks diving in and pulling up into two or three loops before a glorious series of climbing barrel rolls make for one of the greatest sights in historic aviation. The Fury represents a wonderful time in the RAFs history when aerobatic demonstrations and training flights were the order of the day. 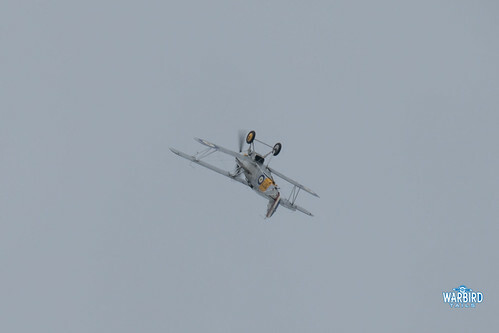 K5674 is the only surviving original Fury and it is a great treat that we are able to see the aircraft in the air and flying as part of UK airshows. Hopefully the 2018 season and the RAF’s 100th birthday will see the Fury get plenty of bookings and the weather may even play ball! More information on the Historic Aircraft Collection fleet can be found here. 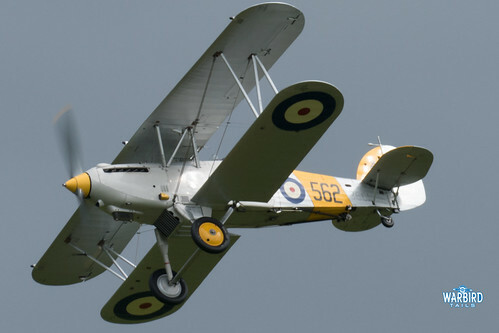 The first Hawker Biplane to be completed for the Historic Aircraft Collection was Nimrod I S1581. The aircraft first flew in 2000 after an extensive restoration. 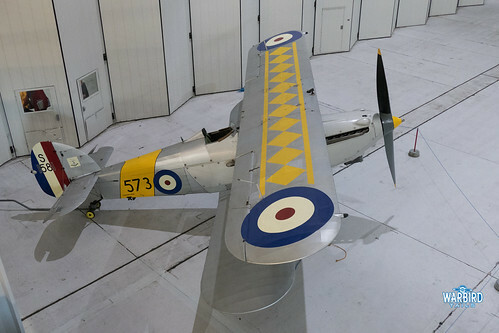 This example now forms part of the Fighter Collection having moved hangars at Duxford in 2004. S1581 was the third Nimrod off the production line and eventually joined 408 fighter flight with the Royal Navy. It is believed this aircraft served on HMS Glorious until 1938. In the 1970s the remains of the airframe were discovered in a London scrap-heap and Aero Vintage acquired the aircraft for restoration. The Nimrod I has been a regular performer at Flying Legends shows over the years, often delivering a graceful high level aerobatic display. In the past two seasons we have been treated to pairs performances from the Fighter Collection’s Nimrod and Historic Aircraft Collection’s Nimrod II. 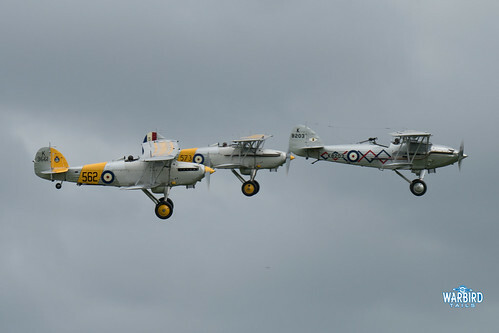 It is a testament to Aero Vintage and Guy Black that we are able to see so many variations of Hawker Biplanes together. More information on the Fighter Collection’s Nimrod can be found here. Much like the first Nimrod restoration, this airframe was discovered on a scrap-heap in Kent in the 1970s. Restoration began in 1992 and the aircraft flew again in November 2006. The Nimrod II provides a fascinating example of this later model design. The swept wing and more refined design make for a great display aircraft especially when seen alongside the Nimrod I of the Fighter Collection or the Fury. 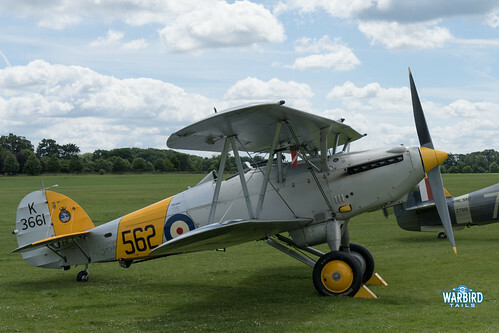 Demon Displays’ aircraft, K8203, is the sole airworthy example of this beautiful type, built by Boulton Paul in 1937. Entering service the same year ‘203 was struck off charge after passing through a number of squadrons and maintenance units, in September 1940. The aircraft now wears the colours it would have worn while flying with 64 Squadron. The fuselage of the airframe was acquired in 1991 and this marked the start of a restoration that would span over 19 years. SkySport engineering carried out the restoration to an incredibly high standard and the Demon took to the sky for the first time in June 2009. 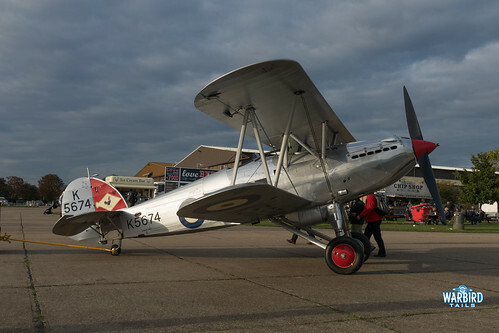 Since then the Demon has become a hugely popular performer at Shuttleworth Collection shows, often displaying alongside the Shuttleworth Collection’s Hawker Hind. 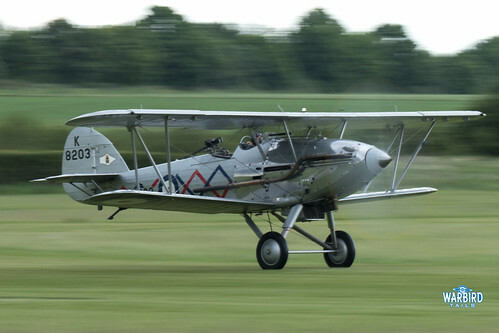 The longest serving Hawker Biplane in civilian hands has to be the Shuttleworth Collection’s Hind. This aircraft was one of the “Afghan Hinds”, being delivered to the Afghan Air Force in 1938. Amazingly this aircraft is believed to have remained in service until 1956! 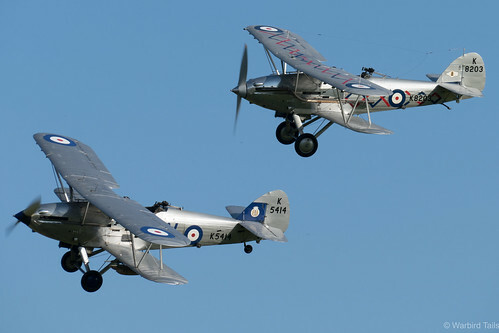 In 1968 two aircraft were sent to the UK, one to the Royal Air Force Museum and one to the Shuttleworth Collection. Once in the UK work started on restoring this example to fly. The aircraft took to the skies again in August 1981, originally wearing Afghan Air Force colours. More recently the airframe has been repainted into RAF colours wearing serial K5414. 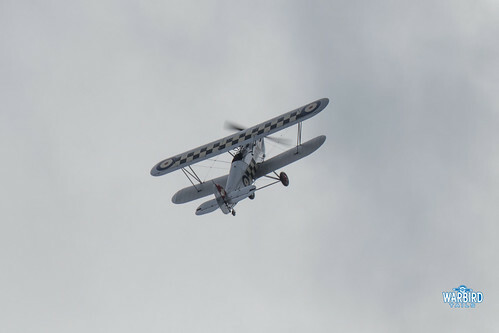 Watching this aircraft formed my introduction to the graceful Hawker Biplane family. I remember being enthralled by the thrilling combination of that familiar Rolls Royce sound and the sweeping 1930s biplane looks. The underwing bomb load combined with typical stylish Shuttleworth flying really left an impression on a young enthusiast. The fact that we enjoyed so many years of this aircraft alongside the Old Warden based Demon is truly incredible. The Hind last flew in 2015 and has since been kept on the ground thanks to engine issues. As far as I am aware the plan is to get the Hind back in flying condition as soon as engine work will allow and so I have included it in this post. 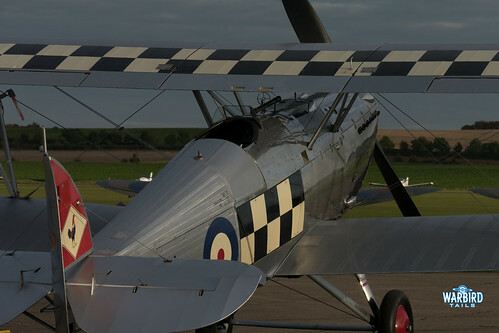 It is certainly an important aircraft and told the Hawker Biplane story by itself for almost 20 years. Information on both the Demon and Hind can be found here. As I said at the top the UK airshow scene and in fact the worldwide scene is made that bit stronger by having this wide array of these unique Hawker Biplanes in flying condition. At both Old Warden and Duxford over the years we have been lucky enough to see regular 3 ship Hawker Biplane formations and even a four ship display on one occasion at Legends. Just 20 years ago this would have been truly unimaginable and it is a testament to all those involved in reviving this important lineage that these aircraft are now on regular display. Thank you for yet another interesting blog with excellent pictures to back it up. I shall take another look at the aircraft available when I go to Duxford at the end of this month. I’d love to one day – a long journey from Kent though! Looks like a great show.